Simeon bar Yochai (Aramaic: רבן שמעון בר יוחאי, Rabban Shimon bar Yoḥai), also known by his acronym Rashbi, was a 2nd-century tannaitic sage in ancient Judea, said to be active after the destruction of the Second Temple in 70 CE. He was one of the most eminent disciples of Rabbi Akiva, and attributed by many Orthodox Jews with the authorship of the Zohar, the chief work of Kabbalah. In addition, the important legal works called Sifre and Mekhilta are attributed to him (not to be confused with the Mekhilta of Rabbi Ishmael, of which much of the text is the same). In the Mishnah, in which he is the fourth-most mentioned sage, he is often referred to as simply "Rabbi Shimon". In the baraita, midrash and gemara his name occurs either as R. Simeon or as R. Simeon ben Yochai, but in the Mishnah he is always quoted as R. Simeon (except for Hagigah 1:7). According to popular legend, he and his son, Eleazar b. Simeon, were noted Kabbalists. Both figures are held in unique reverence by kabbalistic tradition. They were buried in the same tomb in Meron, Israel, which is visited by thousands year round. He was born in Galilee. He was one of the principal pupils of Rabbi Akiva, under whom he studied thirteen years at Beneberak. It would seem that Simeon had previously studied at Jabneh, under Gamaliel II and Joshua ben Hananiah, and that he was the cause of the quarrel that broke out between these two leaders. But considering that about forty-five years later, when Akiba was thrown into prison, Simeon's father was still alive (see below), and that Simeon insisted upon Akiba's teaching him even in prison, Frankel thinks Berachot 28a is spurious. Simeon's acuteness was tested and recognized by Akiba when he first came to him; of all his pupils Akiba ordained only Rabbi Meir and Simeon. Conscious of his own merit, Simeon felt hurt at being ranked after Meir, and Akiba was compelled to soothe him with soft words. During Akiba's lifetime Simeon was found occasionally at Sidon, where he seems to have shown great independence in his halakic decisions. The following incident is recorded, illustrating both his wit and his piety, A man and his wife, childless despite ten years of marriage, appeared before Simeon at Sidon to secure a divorce. Observing that they loved each other, and not being able to refuse a request which was in agreement with rabbinical law, Simeon told them that as their wedding was marked by a feast they should mark their separation in the same way. The result was that both changed their minds, and, owing to Simeon's prayer, God granted them a child. Simeon often returned to Akiba, and once he conveyed a message to him from his fellow pupil Hanina ben Hakinai. Simeon's love for his great teacher was profound. When Akiba was thrown into prison by Hadrian, Simeon (probably through the influence of his father, who was in favor at the court of Rome) found a way to enter the prison. He still insisted upon Akiba's teaching him, and when the latter refused, Simeon jestingly threatened to tell his father, Yochai, who would cause Akiba to be punished more severely. After Akiba's death Simeon was again ordained, with four other pupils of Akiba's, by Judah ben Baba. Tiberias had been built by Herod Antipas on a site where there were many tombs the exact locations of which had been lost. The town therefore had been regarded as unclean. Resolving to remove the cause of the uncleanness, Simeon planted lupines in all suspected places; wherever they did not take root he knew that a tomb was underneath. The bodies were then exhumed and removed, and the town pronounced clean. To annoy and discredit Simeon, a certain Samaritan secretly replaced one of the bodies. But Simeon learned through the power of the Holy Spirit what the Samaritan had done, and said, "Let what is above go down, and what is below come up." The Samaritan was entombed; and a schoolmaster of Magdala who mocked Simeon for his declaration, was turned into a heap of bones. According to the version in Shabbat 33b, Simeon and Eleazar hid in a cavern, whereupon a carob-tree and a spring miraculously appeared there. In order to spare their garments they sat naked in the sand, in consequence of which their skin became covered with scabs. At the end of twelve years the prophet Elijah announced to them the death of the emperor, and the consequent annulment of the sentence of death against them. When they came forth Simeon observed people occupied with agricultural pursuits to the neglect of the Torah, and, being angered thereby, smote them by his glances. A bat ḳol then ordered him to return to the cavern, where he and Eleazar remained twelve months longer, at the end of which time they were ordered by a bat ḳol to come forth. When they did so, Simeon was met by his son-in-law Phinehas ben Jair who wept at seeing him in such a miserable state. But Simeon told him that he ought to rejoice, for during the thirteen years' stay in the cavern his knowledge of the Torah had been much increased. Simeon then, in gratitude for the miracle that had been wrought for him, undertook the purification of Tiberias. He threw some lupines into the ground, whereupon the bodies came to the surface at various places, which were then marked as tombs. Not only was the man who mocked at Simeon's announcement of the purification of Tiberias turned into a heap of bones, but also Simeon's pupil and delator, Judah b. Gerim. It appears that Simeon settled afterward at Meron, the valley in front of which place was filled, at Simeon's command, with gold dinars. On the other hand, it is said that Simeon established a flourishing school at Tekoa, among the pupils of which was Judah I. Grätz demonstrated that this Tekoa evidently was in Galilee, and hence must not be identified with the Biblical Tekoa, which was in the territory of Judah. Bacher argues that Tekoa and Meron were one and the same place. As the last important event in Simeon's life, it is said that he was sent to Rome (accompanied by Eleazar b. Jose) with a petition to the emperor for the abolition of the decree against the three Jewish observances, and that his mission was successful. It is stated that Simeon was chosen for this mission because he was known as a man in whose favor miracles often were wrought. At Rome, too, Simeon's success was due to a miracle, for while on the way he was met by the demon Ben Temalion, who offered his assistance. According to agreement, the demon entered into the emperor's daughter, and Simeon exorcised it when he arrived at the Roman court. The emperor then took Simeon into his treasure-house, leaving him to choose his own reward. Simeon found there the vexatious decree, which he took away and tore into pieces. This legend, the origin of which apparently is non-Jewish, has been the subject of discussion by modern scholars. Israel Lévi thinks it is a variation of the legend of the apostle Bartholomew exorcising a demon that had taken possession of the daughter of Polymnius, the King of India. Israel Lévi's opinion was approved by Joseph Halévy. Bacher thinks there is another Christian legend which corresponds more closely to the Talmudic narrative: that in which Abercius exorcised a demon from Lucilla, the daughter of Marcus Aurelius. Simeon is stated to have said that whatever might be the number of persons deserving to enter heaven, he and his son were certainly of that number, so that if there were only two, these were himself and his son. He is also credited with saying that, united with his son and Jotham, King of Judah, he would be able to free the world from judgment. Thus, on account of his exceptional piety and continual study of the Law, Simeon was considered as one of those whose merit preserves the world, and therefore during his life the rainbow was never seen, that promise of God's forbearance not being needed. The fullest account of Rabbi Shimon's teachings is to be found in W Bacher's Agada der Tannaiten. When the Talmud attributes a teaching to Rabbi Shimon without specifying which Rabbi Shimon is meant, it means Shimon bar Yochai. Simeon's halakot are very numerous; they appear in every tractate of the Talmud except Berakot, Ḥallah, Ta'anit, Nedarim, Tamid, and Middot. He greatly valued the teaching of his master Akiba, and he is reported to have recommended his pupils to follow his own system of interpretation ("middot") because it was derived from that of Akiba. But this itself shows that Simeon did not follow his teacher in every point; indeed, as is shown below, he often differed from Akiba, declaring his own interpretations to be the better. He was independent in his halakic decisions, and did not refrain from criticizing the tannaim of the preceding generations. He and Jose ben Halafta] were generally of the same opinion; but sometimes Simeon sided with Rabbi Meir. Like the other pupils of Akiba, who, wishing to perpetuate the latter's teaching, systematized it in the foundation of the Mishnah (R. Meir), Tosefta (R. Nehemiah), and Sifra (R. Judah), Simeon is credited with the authorship of the Sifre (a halakhic midrash to Numbers and Deuteronomy) and of the Mekhilta de-Rabbi Shimon (a similar midrash to Exodus). The particular characteristic of Simeon's teaching was that whether in a halakhah or in a aggadic interpretation of a Biblical command, he endeavored to find the underlying reason for it. This often resulted in a material modification of the command in question. From many instances the following may be taken: In the prohibition against taking a widow's garment in pledge, it was Judah ben Ilai's opinion that no difference is to be made between a rich and a poor widow. But Simeon gives the reason for such a prohibition, which was that if such a pledge were taken it would be necessary to return it every evening, and going to the widow's home every morning and evening might compromise her reputation. Consequently, he declares, the prohibition applies only in the case of a poor widow, since one who is rich would not need to have the garment returned in the evening. Simeon's name was widely identified with this halakic principle of interpretation, and his teacher Akiba approved of it; therefore his contemporaries often applied to him when they wished to know the reason for certain halakhot. Simeon also divided the oral law into numbered groups, of which fifteen are preserved in the Talmud. He especially favored the system of giving general rules, of which there are a great number. All this shows that he was systematic, and that he had the power of expressing himself clearly. He was dogmatic in his halakhic decisions, but where there was a doubt as to which of two courses should be followed, and the Rabbis adopted a compromise, he admitted the legality of either course. He differed from Akiba in that he did not think that particles like "et," "gam," and others contain in themselves indications of halakot; but in many instances he showed that he was opposed to R. Ishmael's opinion that the Torah speaks as men do and that seemingly pleonastic words can never serve as the basis for deducing new laws. Simeon is very prominent also in the Haggadah, and his utterances are numerous in both Talmuds. Many of his sayings bear on the study of the Torah, which he believed should be the main object of man's life. Despite the stress he laid on the importance of prayer, and particularly on the reading of the "Shema'," he declared that one must not, for the sake of either, interrupt the study of the Torah. He considers the Torah one of the three good gifts which God gave to Israel and which can not be preserved without suffering. But recognizing the difficulty of occupying oneself with the study of the Torah and of providing a livelihood at the same time, Simeon said that the Torah was given only for those who ate the manna or the priestly meals. He declared that had he been on Mount Sinai when God delivered the Torah to Israel, he would have requested two mouths for man, one to be used exclusively as a means for repeating and thus learning the Torah. But then he added, "How great also would be the evil done by delators ["moserim"] with two mouths!" Among Simeon's many other utterances may be mentioned those with regard to repentance, and some of his ethical sayings. "So great is the power of repentance that a man who has been during his lifetime very wicked ["rasha' gamur"], if he repent toward the end, is considered a perfectly righteous man". He was particularly severe against haughtiness, which, he declared, is like idolatry, and against publicly shaming one's neighbor: "One should rather throw himself into a burning furnace than shame a neighbor in public". He denounced the crimes of usury, deceitful dealing, and disturbing domestic peace. His animosity toward the Gentiles generally and toward feminine superstition is expressed in the following utterance: "The best of the heathen merits death; the best of serpents should have its head crushed; and the most pious of women is prone to sorcery." His hostility to the Romans, mentioned above, is expressed also in his maxims; thus, alluding probably to the Parthian war which broke out in the time of Antoninus Pius, he said: "If thou hast seen a Persian [Parthian] horse tied in Palestine, then hope for the arrival of the Messiah"
R. Simeon combined with his rationalism in halakah a strange mysticism in his aggadic teachings, as well as in his practise. He spoke of a magic sword, on which the Name was inscribed, being given by God to Moses on Sinai; and he ascribed all kinds of miraculous powers to Moses. After his death he appeared to the saints in their visions. Thus his name became connected with mystic lore, and he became a chief authority for the kabbalists; for this reason the Zohar first appeared under the name "Midrash de-Rabbi Shim'on ben Yochai". There also exist, two apocryphal midrashim ascribed Simeon: "The Secrets of Rabbi Simon ben Yohai" and "Tefillat R. Shim'on b. Yoḥai". Both of them bear on the Messianic time, but the second is more complete. The main point of these midrashim is that while Simeon was hidden in the cavern, he fasted forty days and prayed to God to rescue Israel from such persecutions. Then Metatron revealed to him the future, announcing the various Muslim rulers, the last one of whom would perish at the hands of the Messiah. As in similar messianic apocrypha, the chief characters are Armilus and the three Messiahs: Messiah b. Joseph, Messiah b. Ephraim, and Messiah b. David. While he is attributed authorship of the Zohar by many kabbalists, the authenticity of this claim has been challenged by both secular and religious scholars. who point to Moses de León as the author who published the Zohar in the 13th century. Better for that man to make himself fall into a fiery furnace than to embarrass his neighbour publicly. There are three crowns – the crown of the Law, the crown of the priesthood, and the crown of kingship; but the crown of a good name excels them all. The Holy One, blessed be He, has given three gifts to Israel: Torah, the Land of Israel, and the world to come. A bird without heaven's consent cannot perish. How much more, then, man himself! He that causes a man to sin is worse than he that had killed him. I have seen those destined for the world to come. If they be thirty, my son and I are among them. If they be ten, my son and I are among them. If they be two, my son and I are them. The Divine Law (Torah) was not given to expound, except unto those who eat manna (i.e. to those who are free from worldly cares and worries). Bar Yochai died on the 33rd day of the Omer, known as Lag BaOmer. On the day of his death, he revealed deep kabbalistic secrets which formed the basis of the Zohar. According to the Bnei Yissaschar, on the day of his death, bar Yochai said, "Now it is my desire to reveal secrets... The day will not go to its place like any other, for this entire day stands within my domain..." Daylight was miraculously extended until he had completed his final teaching and died. As such, the custom of lighting fires on his yahrzeit (anniversary of death) symbolizes this revelation of powerful light. His yahrzeit is widely known as a Yom Hillula, a day of celebration. This is based on the original text of Shaar HaKavanot by Rabbi Chaim Vital, which refers to the day as Yom Simchato ("the day of his happiness"), rather than Yom SheMet ("the day that he died"). There is thus a very widely observed custom to celebrate on his yahrzeit at his burial place in Meron. With bonfires, torches, song and feasting, the Yom Hillula is celebrated by hundreds of thousands of people. This celebration was a specific request by Rabbi Shimon bar Yochai of his students. Some say that as bar Yochai gave spiritual light to the world with the revelation of the Zohar, bonfires are lit to symbolize the impact of his teachings. As his passing left such a "light" behind, many candles and/or bonfires are lit here as well as in locales throughout Israel and the Diaspora. At the tomb of Rabbi Shimon, the honour of lighting the main bonfire traditionally goes to the Rebbes of the Boyaner dynasty. This privilege was purchased by Rabbi Avrohom Yaakov Friedman, the first Sadigura Rebbe, from the Sephardi guardians of Meron and Safed. The Sadigura Rebbe bequeathed this honor to his eldest son, Rabbi Yitzchok Friedman, the first Boyaner Rebbe, and his progeny. The first hadlakah (lighting) is attended by hundreds of thousands of people annually; in 2001, the crowd was estimated at 300,000. It is customary at the Meron celebrations, dating from the time of Rabbi Isaac Luria, that three-year-old boys be given their first haircuts (upsherin), while their parents distribute wine and sweets. Mark (behind blue fence) over cave in which Rabbi Ele'azar bar Shim'on is buried. This main hall is divided in half in order to separate between men and women. Another custom at the tomb of Rabbi Shimon bar Yochai is the giving of Ḥai Rotel (Hebrew: ח״י רוטל‎). The Hebrew letters chet and yod are the gematria (numerical equivalent) of 18. Rotel is a liquid measure of about 3 litres. Thus, 18 rotels equals 54 litres or about 13 gallons. It is popularly believed that if one donates or offers 18 rotels of liquid refreshment (grape juice, wine, soda or even water) to those attending the celebrations at bar Yochai's tomb on Lag BaOmer, then the giver will be granted miraculous salvation. According to Taamei Minhagim, many childless couples found success with this segula (propitious practice). This practice was also endorsed by Rabbi Ovadia miBartenura and The Shelah HaKadosh. The Bobover Rav, Ben Zion Halberstam sent a letter from Poland to his Chassidim in Israel asking them to donate chai rotel in Meron on this holy day on behalf of a couple that did not have children. Several local organizations solicit donations of chai rotel and hand out the drinks on the donor's behalf in Meron on Lag BaOmer. Nine months after Lag BaOmer, the Ohel Rashbi organization even invites couples who prayed at the tomb and had a child to come back to Meron to celebrate the births. Some of his views were seemingly very hostile towards gentiles. The Jewish Encyclopedia of 1906 describes him as the preeminent anti-gentile teacher. Simeon bar Yochai is often quoted by antisemites in his saying "Best of gentiles kill him, best of snakes cut its head, the most pious of women is prone to sorcery." This hostility to Romans is repeated in one of his maxims: "If you see a Persian horse tied in Israel, then hope for the arrival of the Messiah." Because of the apparent extreme animosity in Bar Yochai's quote, some later translations of his writings were altered to replace "the best of gentiles" with "the best of Egyptians" to better reflect the full context of the quote. ^ Rabbi Shimeon bar Yoḥai. ^ Drew Kaplan, "Rabbinic Popularity in the Mishnah VII: Top Ten Overall [Final Tally] Drew Kaplan's Blog (5 July 2011). ^ Leviticus Rabbah 21:7 et al. ^ Compare "Tefillot R. Shim'on b. Yoḥai" in Jellinek, "B. H." iv. 117 et seq., where, instead of "Ben Temalion," "Asmodeus" occurs. ^ in "R. E. J." viii. 200 et seq. ^ Found in the "Acta Apostolorum Apocrypha" ed. Tischendorf, pp. 246 et seq. ^ In "R. E. J." 10:60 et seq. ^ ib. 35:285 et seq. ^ a b Bava Metziah 115a et al. ^ Bikurim 3:10; Zevachim 119b et al. ^ Sifre Re'eh 119; Rosh Hashana 8b; Zevachim 108b et al. ^ Published by Jellinek, "B. H." iii. 78 et seq., iv. 117 et seq. ^ Rabbi David Bar-Hayim. "Truth, Authenticity, Tradition and Reason: Who Wrote the Zohar?". Machon Shilo. ^ Rabbi Yiḥyah Qafiḥ. "The Holy Wars Against the False Qabalah of the Zohar". chayas.com. ^ editors, editors (1980). The Babylonian Talmud (Sotah 10b). Jerusalem: Menaqed. ; there is a dispute, however, whether this quote is attributed to Rabbi Simeon bar Yochai or to Rabbi Simeon Hasida. Since the matter remains unresolved, it is brought down here as a possibility. ^ editors, editors (1978). Six Orders of the Mishnah – Seder Nezīqīn (Pirḳe Avot 4:13). Jerusalem: Eshkol. ^ editors, editors (1980). The Babylonian Talmud (Berakhot 5a). Jerusalem: Menaqed. ^ editors, editors (1987). Midrash Rabba (Esther Rabba 3:7). New York. ^ editors, editors. Sifrei (on Deuteronomy 23:8-9). ^ Buber, Salomon (1949). Pesikta de-Rav Kahana 88a. New York. , cf. Jerusalem Talmud (Berakhot 9:2) and Babylonian Talmud (Sukkah 45a and Sanhedrin 97b, which in the two latter versions, the text reads: "I have seen the benei ʿaliyah, etc." ^ editors, editors. Mekhilta (on Exodus 16:4). ^ Bnei Yissaschar (1883 ed.). Piotrkow. pp. Iyar, Discourse 3:6. ^ Silberberg, Naftali (2011). "Lag BaOmer Traditions and Customs". chabad.org. Retrieved 5 December 2011. ^ Rossoff, Dovid (2005). קדושים אשר בארץ: קברי צדיקים בירושלים ובני ברק [The Holy Ones in the Earth: Graves of Tzaddikim in Jerusalem and Bnei Brak] (in Hebrew). Jerusalem: Machon Otzar HaTorah. pp. 315–316. ^ Brayer, Rabbi Menachem (2003). The House of Rizhin: Chassidus and the Rizhiner Dynasty. Mesorah Publications. p. 435. ISBN 1-57819-794-5. ^ Rossoff, Dovid. "Meron on Lag B'Omer". The Jewish Magazine. Retrieved 2010-04-28. ^ Lebovits, Moishe Dovid. "Lag BaOmer". Halachically Speaking. p. 6. Retrieved 27 April 2010. 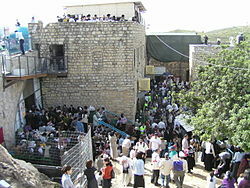 ^ a b "Over 500,000 Expected in Meron for Lag Ba'omer, 5769". matzav.com. 2009-05-11. Retrieved 2010-04-28. ^ a b "Chai Rotel Segulah". YeshuosRashbi.com. Retrieved 14 April 2013. ^ a b "GENTILE - JewishEncyclopedia.com". www.jewishencyclopedia.com. Retrieved 8 April 2018. ^ "SIMEON BEN YOḤAI - JewishEncyclopedia.com". www.jewishencyclopedia.com. Retrieved 8 April 2018. ^ "Shir HaShirim Rabbah 8:9". www.sefaria.org. Retrieved 8 April 2018. This article incorporates text from a publication now in the public domain: Singer, Isidore; et al., eds. (1901–1906). "SIMEON BEN YOḤAI". The Jewish Encyclopedia. New York: Funk & Wagnalls. Wikimedia Commons has media related to Tomb of Simeon bar Yochai.